Once again, the Buckeyes entered halftime with a tenuous lead over their unranked, out-of-conference opponent. Still, they were able to pull away from Wyoming in the second half, winning 65-50. The Ohio State defense was the culprit, early, allowing the Cowboys to score 24 points in the paint. OSU entered the locker room up, 38-34. Heading into halftime during their last game against American, the Buckeyes led by only five. It took a significant, second half turnaround to pad the lead. Tonight’s game was not much different, in that respect. Ohio State held Wyoming to 15-percent shooting from the field in the second period, igniting a run to put the game out of reach. In the last ten minutes of the game, the Buckeyes outscored the Cowboys 17-3. Although the offensive production tailed off, overall, senior point guard Aaron Craft scored all 10 of his points in the second half. Fellow senior guard Lenzelle Smith Jr. added eight of his own in the half, including a dagger three-pointer with 5:56 left. That, on top of a couple fast-break baskets from Craft, put OSU up by double digits. Junior center Amir Williams continues his strong start to the season, notching his second double-double. He finished the game with 12 points and 16 rebounds. Half of those boards came on the offensive glass, allowing Williams to convert most of his points. "Coach told us there would be a lot of opportunity for us to get offensive rebounds tonight," Williams said. "I just took advantage of what the offensive had and got those tip-ins." 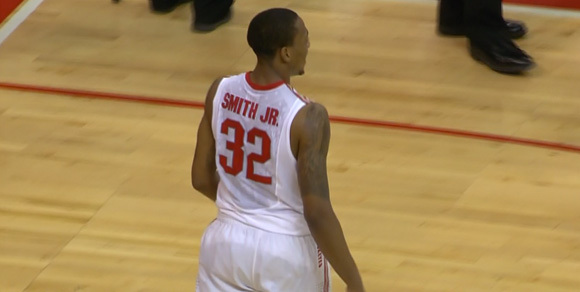 Smith Jr. was the only other Buckeye in double figures, pacing the Buckeyes with 20 points. A lineup with him, Craft, Thompson, Williams and junior guard Shannon Scott played the majority of the second half. Junior forward LaQuinton Ross struggled again, scoring three points and shooting 1-7 from the field. He played five minutes in the second half, and is now hitting 23 percent of his shots on the season. The only other OSU players to score more than one field goal were freshman forward Marc Loving, who dropped six points, and Scott, who added seven. Loving did not see the floor in the second half. Larry Nance Jr. – son of the former NBA player – led the way for Wyoming, scoring 17 points. The junior forward was the only Cowboy in double figures. After being whistled for a loose-ball foul and picking up his fourth personal, Nance Jr. went to the bench. Over the next eight minutes, the Ohio State outscored Wyoming by 12. "It was really cool coming back home," said Nance Jr., an Akron native. "It was a dream come true playing on this court. I’m proud of our team played tonight and the way we handled ourselves." The Buckeyes (5-0) will host North Florida, Friday, at 5 p.m.